How Saying Yes To The World Opens Your Heart To Love. A few days back, I changed the Display Picture of my Whatsapp (though I hardly ever use it, being the loner that I am). It read: Say YES to new adventures! Why? Because I had just been open minded enough to say yes to one such adventure and was now hungry for more. 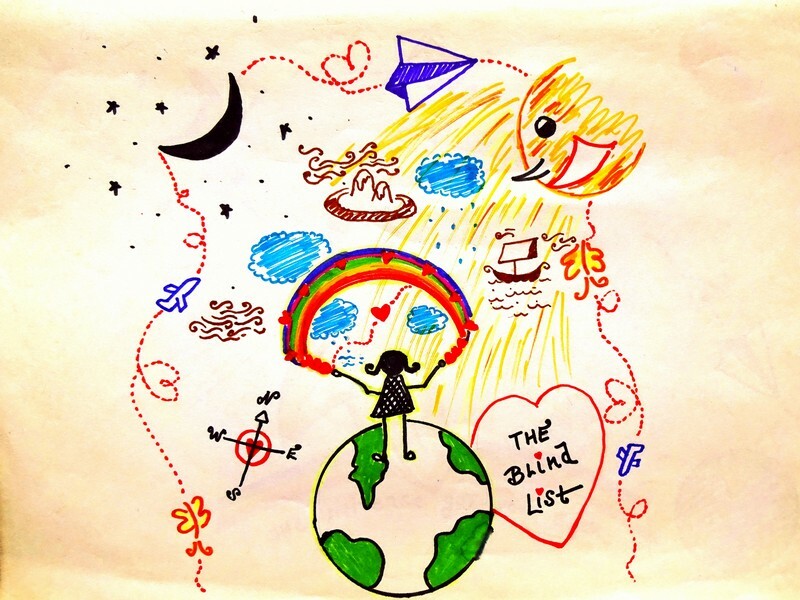 So, when IB and Luftansa came up with this idea of falling blindly in love with the world, by creating The Bucket List #TheBlindList, I sat up to take notice. What if the world invited you on a blind date? To travel to a place you know nothing about for an experience you have no clue about? Would you be openminded enough to say yes to the world? Saying YES to the World! 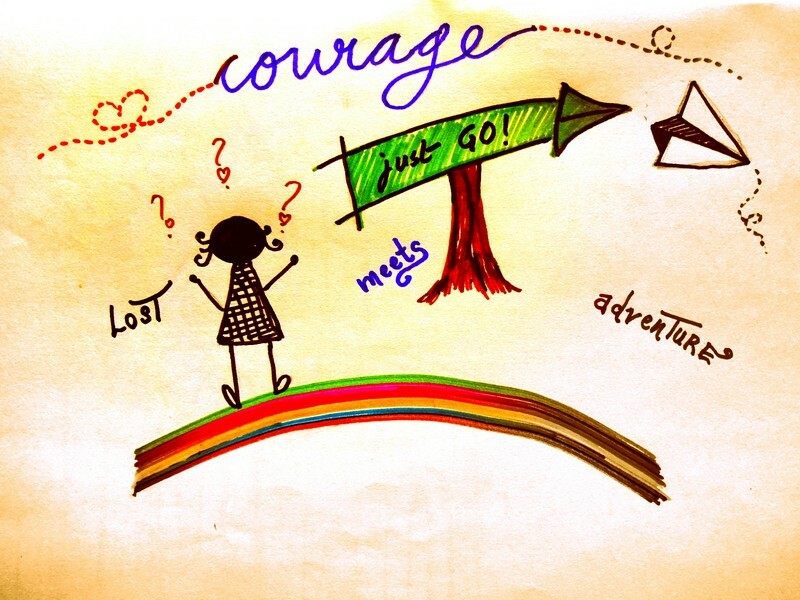 The thought of stepping into an uncharted territory makes me restless, anxious, and fearful, just as much as or a maybe even a little more than it makes me excited, eager and upbeat. To give up on things and people that provide security, comfort and pleasure can be so difficult more often than not. Uncertainty creeps into my heart and scares the crap out of me. Will this proposal strangle me? Extinguish my fire? Plunge me further into darkness? Kill me?? Yes but not in a way that I think it to be. O Heart, are you mad? How do I walk the unknown paths, the paths that I cannot see? By faith Abraham obeyed when he was called . . . .
And he went out, not knowing where he was going. — Hebrews 11:8. To counter the many logical questions of my mind and to say my Yes to the World, I would take some travel inspiration from Abraham. I would cling to the One who knows all things, before exercising my faith by standing on the edge and jumping into the unknown. Saying YES to the uncertainty that the future holds would be easier as I rest in the knowledge that I’am in good hands -- regardless of what might lay ahead of me or where my Father might be leading me to. Getting Lost While Exploring the World. Stepping into the unknown brings to life – life itself… that life that had until now been running on autopilot. Suddenly, she is eager for interaction - asking me for my choices, my likes and my decisions. Choices and decisions.. that are not easy to make as they bring with them the alarm bell of responsibility. Inundated with the numerous voices and opinions in my head, I struggle, cry (a lot – very healing! ), feel embarrassed at the choices I make and sometimes pity the sorry state of my own self. It hurts – hurts like hell. To be lost, in the muddy puddles that fear leaves aside in the form of anxiety, despair and misery. All this after saying your yes. My body cringes at all the worries and unanswered questions racing and plaguing through my mind. Where is this path leading to? Have I done the right thing by saying yes? Where in the world would I open my eyes to greet a brand new day tomorrow? I feel a surge of the so called negative emotions raging through my veins BUT does this mean I quit? NEVER! Lost is crazy for adventure. Taking a deep breath and sitting in quiet silence has the answers to many an unresolved of our mysteries. I would sit myself down and patiently, gently ask myself sincerely where is it that I really want to be and what is it that I truly want to do. Opening a channel for a healthy dialogue between the conflicting voices, the perfectionist part of me will have to be constantly reminded that it's okay to hurt. Life is just as brutal as it is beautiful – that there are no quick answers and neither do I need them. My fears and my struggles are giant blessings that are here for my own growth, as a price to be paid back for the rich treasures of life. This moment of epiphany, this particular one is a gem, a rare dazzling gem. Reminding me of the juicy magic that happens in two seemingly simple words – I Am. I am open like the throbbing passionate sea, ready to embrace the infinities of the horizon in my pulsating gaze. I am the fiery light, that cracks through the mountaintops, the first thing in the morning. I am the roaring sea, the gentle winds and also the mellow sunset after a long tired day. I am vulnerable like nature, never perfect but just me. And it is enough. Life meets me, here, in this moment, when I stop over thinking and start acting spontaneously, fully secure in the belief that I am not alone in this journey of mine… that I am so much more than this image of my restricted, individuated being. I am always, inherently, connected to something beyond my own self; the appearance of being separate from everything else is merely an illusion, a temporary, impermanent state of experience that belies my actual aware state of experience. 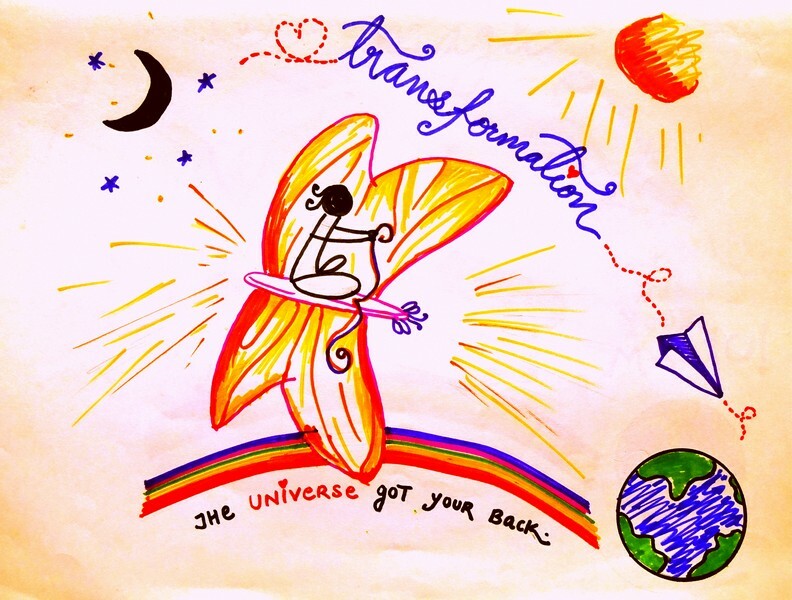 Taking baby steps in my renewed confidence and vigor… it’s time to broaden my horizons, expand my mental boundaries, deepen my understanding and push open my wings and fly! And flying I am, with eyes brimming in magic, wonder and intrigue. 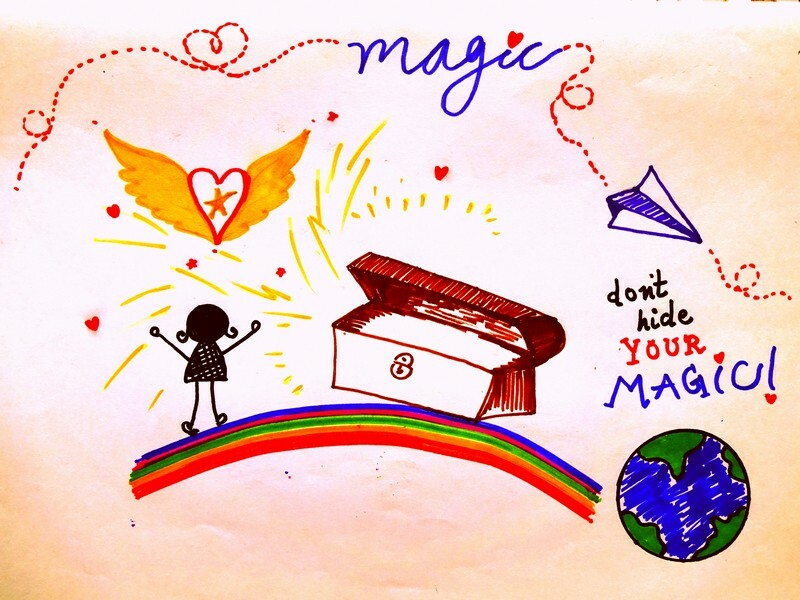 Once I rid myself of any expectations about how I’d want things to go, I open myself up to a whole new set of experiences and possibilities I could never have imagined otherwise. Everything else that follows is just that - a dream, the one that I never actually saw but the one that came to me as a gift for my faith and commitment to the Universe. People, strangers, they all join in from nowhere -- finding, appreciating that unexpected beauty in the rawness, muddiness and craziness of life, enjoying the ride, no matter how bumpy — ah well, did someone say adventure? There is no time to think, just to see, every moment as they are unraveling before me. Tasting the new with my tongue and biting into the exciting with my senses is exhilarating as I am kissed so warmly by the early rising sun. in all my brilliant magnificence that I was always meant to be. Nourished with enriching experiences and every ounce of the sweet raw transformative power of the journey, my blind quest now comes to a vivid realization: Of the beauty there is to the existence I had no damn clue about, of the divinity that makes me and them, all of us who we are, the most magnificent of God’s creations, humans, and of an unfailing connection to that unique core that binds us all, as harbingers of love and light, in one single frame of life. 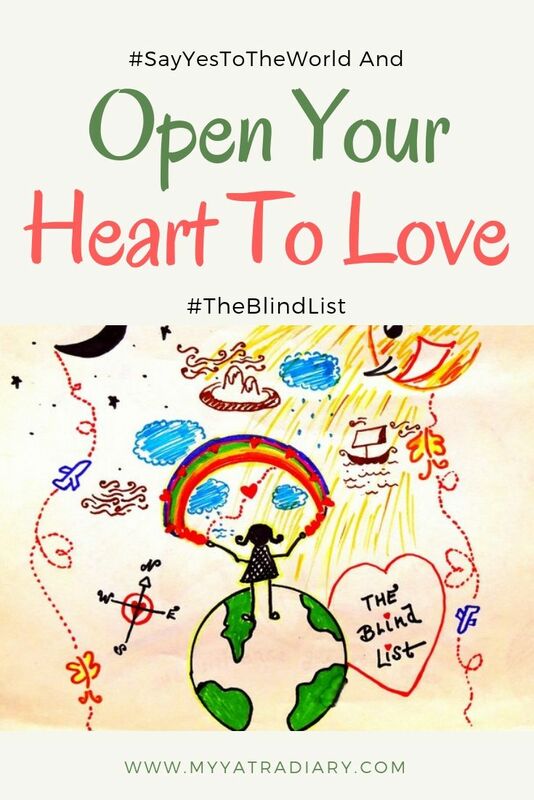 Rediscovering the Blind Love for the World. What happens after saying yes to the world? Is it a season for a few moments or will it last for ever? Will there be a happily ever after? Peeping out of the window, I see the promise of a beautiful rainbow in the distant horizon. Within the rainbow, I see many different colors, blended together in beads of love. All the beauty, all my realizations, and my blind date with the world flashes before my eyes in one single second. The dark cloud of thoughts that once threatened, poured, have now calmed down, leaving a beautiful rainbow in my heart, my window to the world. lots of it - every time - with you. I don’t know the whole story. No one does. But what I do know is that right now, standing at the edge of my world, in this moment, I feel free. My heart roars, calling - longing for more, more blind dates with the world. It knows the world is there, longing also for me. I could never settle again - I won't. I am ready to say yes to new adventures. 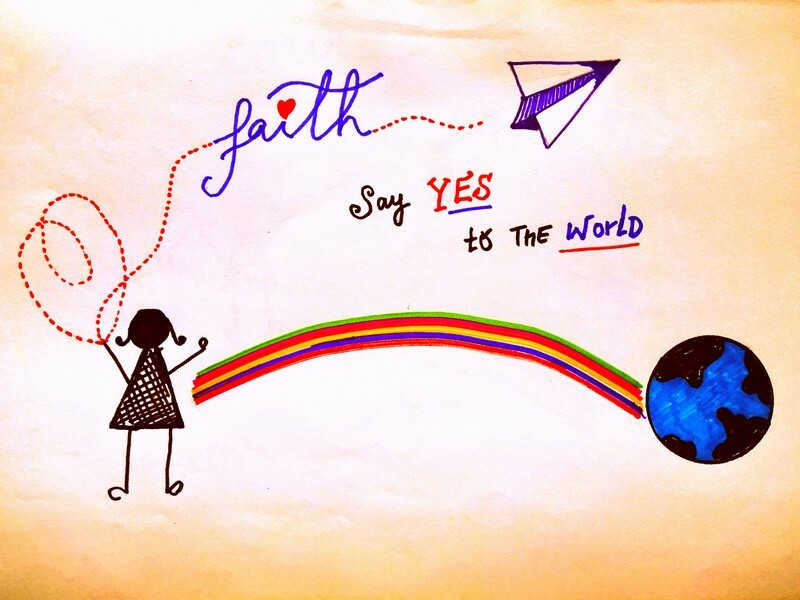 I am ready to say YES to the world! Do add your thoughts in the comments section below! Interesting and very well written post Arti...Thanks for sharing such a great thoughts with us...Have a nice Sunday...!!! That is wonderful you've had a change of mind and see exploring the world in new light. Looking forward to reading about the new adventures you'll have! Love the post and the art is just so quirky and fun. Do you draw? I love the way the freedom in your art mirrored the new freedom in your mindset, and the imagery of the rainbow is beautiful. The amount of freedom we give ourselves to explore new things does seem to change over time, and sometimes we need these prompts to challenge our thinking. I took inspiration from Dr Pepper. After all, "what's the worst that could happen?" And out of that have emerged some great adventures and some less fine ones that have turned into great travelers' tales. Looking forward to reading all about yours. First of all, your illustrations are so attractive! It is sometimes difficult to step into the unknown or to take a risk. But, those often are the times that are most fulfilling. I cannot wait to read where your journey takes you as you say Yes to the World. I love the idea of just going somewhere you’ve never been and know nothing about all while stepping out on faith. Self exploration is quite important and I firmly believe I wouldn’t know nearly so much about myself without travel. There’s so much power in feeling free and even in not knowing the entire story! Your post makes me remember the times (only a decade back) when we used to travel without knowing 'everything' about a destination. There was an undeniable charm in the unknown. This post motivates to travel the world to explore beautiful life on this planet. I loved your drawings as they matches to theme. I would love to hear your travel stories. I love this! So often in our lives, we find reasons to say "no" to travel experiences or simply trying something new. I loved how you phrased it, saying yes to a blind date with the world. This is such a great motivation! I love to travel and cannot imagine my life without traveling since I first went for few months trip solo backpacking. Such an eye opening experience! I loved this post. Very well written and very well illustrated. Going on a blind date with the world is probably the best way to discover it and love it. I have always wondered how going on a blind date in the real world can actually cause us to like or dislike the person. However, with the world there is never a dislike. All of us always end up falling in love. Very well written! We couldn't agree more. We're trying to open up more and more to the world as we travel full time as a family. Travel helps us to understand the world more intimately and also the people. That's why I never get tired of it. How nicely you have written slowly opening up. I liked the colorful sketches too. Wonderful experience to go to a place where you don't know anything. Wonderful art and words, Arti. May everyone say yes to travel and become a better person. Our world will be even more beautiful. I love that you're saying yes to the world. If we get rid of our preconceived notions about what's out there, we are a lot more accepting of other people and experiences. I have friends who have never been outside of their little corner of the world, only staying within 3 states. The have no desire to experience to world as you or I might. It's too bad because they are missing out on a lot of great experiences out there. I'm in the phase of asking my heart how I'll walk on the path, Arti. I've just said "Yes" to a venture that will force me to open up to the world and dig deep into myself again and again to keep going. When I'll encounter times where I feel I cannot carry on (and there'll be plenty), this post will be one I'll return to for reminding myself about the endless possibilities that holding on can bring. You truly are an amazing person - someone who delights me with words as much as with your travel experiences. Happy Diwali! Loved this post interesting & funny ways you have explained . Read my same post as like you i have written but some style is different.